Dried strawberries are fantastic on cereal, as a crisp snack, or as part of a trail mix blend of dried fruits and nuts. These berries keep their color when they are dehydrated without an acidic solution pre-treatment, unlike apples, pears, and many other fruits, making them beautiful all on their own. 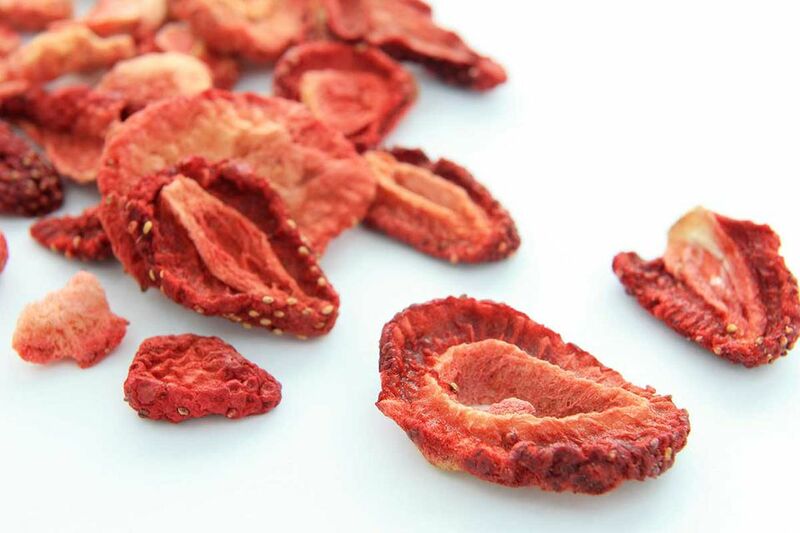 Remember that your dried strawberries will only be truly delicious if you start out with good quality fresh fruit. With strawberries, that means a delightful aroma and a strong burst of flavor when you bite into them. Although supermarket strawberries are available year-round, the best ones are grown locally and are usually in season in spring and early to mid-summer. Once you have the containers of bright red, juicy strawberries, there are a few steps to follow to make perfectly dehydrated fruit. It is important that you begin with clean strawberries; you don't want to dry the berries along with any dirt that is on the surface or in the little nooks. Place the strawberries in a colander and rinse under cold water. Let them drain for a few minutes and leave them to dry; extra moisture will lengthen the dehydration process. Next, you need to hull the strawberries, which means to remove the green leafy top and stem. You are basically coring the berries, and there are a couple methods you can choose from to accomplish this. Instead of simply slicing off the top of the berry, you need to cut out the stem. You can do this with the tip of a sharp, small knife, angling the blade and cutting around in a circle until the core is released. Alternatively, you can use a straw, inserting it into the bottom point of the berry and then gently pushing up until the top with the green leaves is released. This is a good method when you have a lot of strawberries to hull, but it does leave the berry completely hollow so the straw method is not ideal for every recipe. In order to dry the strawberries, they need to be cut into even sized slices. Using a sharp knife, slice the strawberries either crosswise or from top to bottom; the direction you slice them is less important than the thickness. The pieces need to be all of approximately the same thickness or they won't dry evenly. Aim for 1/8 to 1/4-inch thick slices. Now you are ready to dehydrate the berries. Arrange the strawberry slices on the dehydrator trays so that there is at least a half-inch of space between the slices. Set the dehydrator's temperature to 135 F/57 C. It will take 8 to 10 hours to fully dry the strawberries; 10 to 14 hours if you want them to be crisp rather than pliable. The pieces should feel totally dry to the touch when done. You won't be completely sure if the strawberry pieces are fully dehydrated until they have cooled. Turn off the dehydrator, open it, and let the strawberries cool for 20 to 30 minutes. After the cooling off period, break one of the pieces of fruit in half. There should be no visible moisture along the surface of the break. Store in airtight containers in a cool, dark spot. Even after the strawberries are correctly dehydrated there may still be some residual moisture in the fruit that you can't feel. This shouldn't be enough to prevent the berries from being safely preserved and mold-free. But you'll have a tastier, better product if you do what is called "conditioning" the dried fruit. Put the dried, cooled fruit pieces into glass jars, only filling the jars about 2/3 full, and cover the jars. Shake the jars a couple of times a day for one week. This redistributes the fruit pieces as well as any moisture they may still contain. If any condensation shows up on the sides of the jars, your fruit isn't dried well enough yet and it needs to go back into the dehydrator for a few hours. Once your dried strawberries are conditioned, store them in airtight containers away from direct light or heat.